Can You Read a Quake? An earthquake has just hit. Can you tell where? You first need to know how to read a seismogram. You should review how a seismograph works before you do this activity. A good seismograph can detect seismic waves from an earthquake thousands of kilometers away. In this activity, you will learn how to understand and get information from a seismogram. When you know how to read a seismogram, you can determine how strong the waves are (their intensity, amplitude, and energy). You can also determine how far away the epicenter is from your seismograph. You will later learn how to find this epicenter distance when you do the activity Race of the Waves. Suppose your seismograph suddenly begins to receive earthquake waves. At the same moment the first waves arrive, you start your stopwatch. 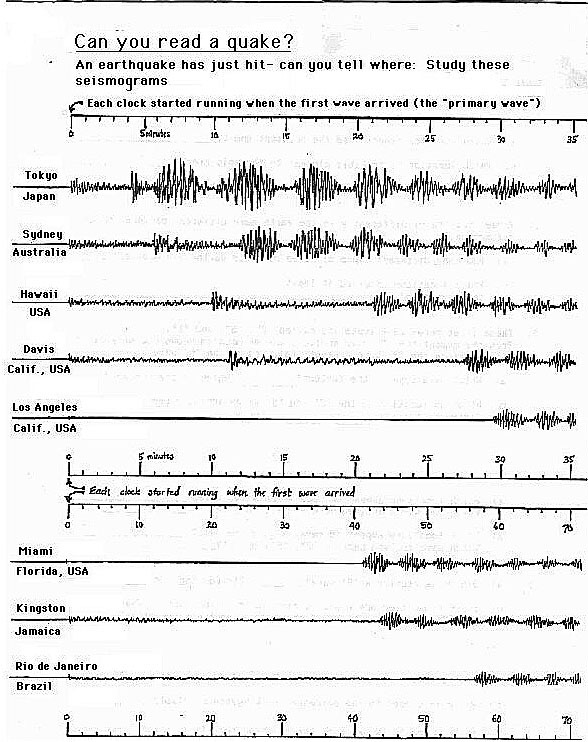 This is how each city below measured the waves that they received: They started their stopwatches when the fist seismic wave (Primary wave) arrived. All of these waves in all of the cities below came from the same epicenter. (Later you can locate this epicenter in the activity Where Did the Quake Hit?). 1.Look carefully over the eight seismograms from the seismic stations around the world. a) Which location experienced the greatest shock? How can you tell? b) Which location is probably closest to the epicenter? c) Which location is the farthest from the epicenter? 2. A typical earthquake sends out at least three types of waves: Primary (P), Secondary (S), and Surface (L) waves. These waves travel differently in the earth and make different patterns on the seismogram. For example, L waves are normally the last to arrive (take the longest time), but they also cause the most surface damage to a city. a) Tokyo received all three types of waves. Locate on the Tokyo seismogram the beginning of the P waves. How many minutes did the Tokyo clock read when the first P waves hit Tokyo? b) How many minutes did the Tokyo clock read when the first S wave hit Tokyo? c) How many minutes did the Tokyo clock read when the first L wave hit Tokyo? 3.Name the four locations that received all three types of waves (P, S, and L). 4. From the moment the first P wave arrived, the seismogram shows how many minutes passed before the S waves arrived, followed later by the L waves. a) Which type of wave is the fastest? b) Which type of wave is the slowest? c) At which location did the P and S waves arrive closer together -- San Francisco or Hawaii? What does this tell you about the location of the epicenter? 5. At some locations, not all of the three waves arrived. a) Which locations appear to have received only P and L waves, but no S waves? b) Which locations appear to have received only L waves? 6. Some locations that are close to each other did not receive the same waves. a) Did San Francisco receive a P wave? did Los Angeles? b) Compared to the size of the earth, these two cities are close to each other. Why do you think the P wave arrived in one of these cities but not in the other? Make a good hypothesis to explain this observation. 7. Look at the L waves for Kingston, for Jamaica and for Miami, Florida. a) Which one -- Kingston or Miami -- is probably closer to the epicenter? How can you tell from the seismograms? b) Did Kingston receive a P wave? did Miami receive a P wave? c) These two cities are not very far from each other on the earth. Why did the P wave arrive in one of these cities but not in the other? Make a good hypothesis again. Return to the main lesson ("Earthquake!"). All text, images, and other resources in this page are Copyright © 1995, The Regents of the University of California. All rights reserved. For permission, email outreach@cea.berkeley.edu.